UPDATE: I posted a full & final review of the Sapira on 02/18/2017 after 70 days of sleeping on it. CLICK HERE to see the full, written review. For our second attempt at a new mattress (see prior review here), we decided to try out the Sapira Mattress. 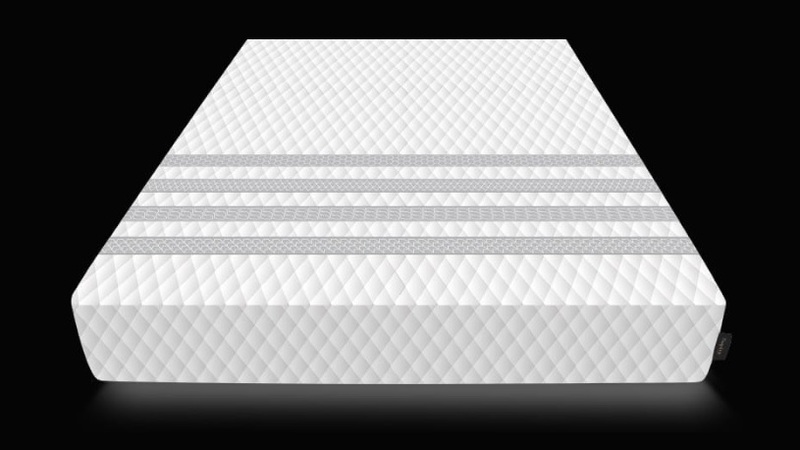 The Sapira Mattress was created by the Leesa company, and is their offering in the hybrid category. 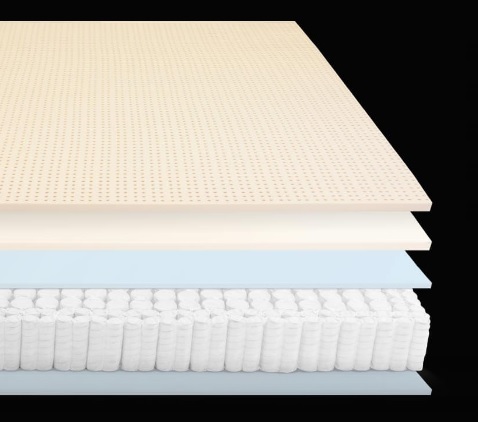 The word "hybrid" can mean many different things in the mattress world, but in this case it is essentially a cross between a memory foam mattress and an innerspring, offering the best features of each, and mitigating some of the drawbacks of all-foam or all-coil mattresses. I won't go into loads of detail on the construction as you can read all about it on the Sapira web site, but I'll hit the highlights. The top layer is called the "Cooling Performance Layer" and is punched with a bunch of little holes for breath-ability. It's pretty dense and responsive, has good bounce, and is not at all like a traditional memory foam feel. Just very nice and very smooth. The next layer is the "Pressure Relieving Memory Foam Layer." This is more like traditional memory foam and is slow to respond, provides pressure point relief, and creates a moderate degree of contouring. However, since it's not the top layer, and it's only 1.5 inches thick, there's no feeling of being enveloped. The base is a sandwich of pocketed coils and stabilizing foams. (The blue foam in the picture is really just to provide stability and to hold the springs in place it seems.) The pocketed coils provide the support. We're about a month in to the no-risk trial period, which is 100 days. So far so good! This is definitely a better fit for us than the Saatva was. The biggest problem we had before was due to a large weight disparity between my wife and I (she is significantly lighter than I am). No problem there with Sapira. It holds me in place nicely, but my body impression doesn't go out more than a couple inches from me, so Debbi has her side nice & level and all to herself. I would rate the firmness right around 7 (where 10 is the most firm). Regarding the feel, it's kind of a luxurious feel. I know that sounds rather generic, so I'll try to elaborate more. It's a tight top, IE, not tufted. It's totally flat before you lay on it. Once you lay on it, it is forgiving yet somewhat firm. In a very general sense, it's what I'm looking for. The top two layers work together very nicely. 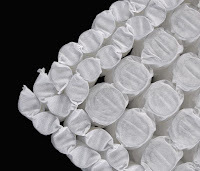 It creates full and complete support under my lower back (locally) without bending the whole mattress (globally). Regarding back pain relief, it helps some. For years I have had some lower and mid back pain, and general aches and pains when I wake up in the morning. I have a bad back, which is something I've had since high school. It's not terrible, just more of an annoyance. I know some have it far worse. With that in mind, most mornings when I wake up from the Sapira, I feel "decent" in the back pain department -- I don't know that I can ever feel amazing, so I'm pretty happy with "decent." Lately I've only been taking one ibuprofen every morning instead of two (update, 05/16/2017: I'm happy to report that I've decreased my ibuprofen intake even further as my body has adjusted more and more!). I want to sleep on my back more, but I do still flip onto my side quite a bit. I'm trying to adjust to this style of mattress and am still experimenting with how thick of a pillow to use, if I want a pillow under my knees, and just generally trying to figure out the best way to sleep in my Sapira. Fortunately, they provide a good long trial period to figure that out. on the edge and it's virtually as good as a traditional all-spring mattress. I think that's because they use more dense, smaller pocketed coils near the edges. See the picture at the right. So far, I'm liking the Sapira but I feel like I'm still in the adjustment period. I will keep you posted and update my review once I'm ready to make more detailed observations! There is a risk-free in home trial period of 100 days, and you can return it during that trial period for a full refund. Shipping is free if you set it up yourself (it comes compressed in a box). If you want white-glove delivery and setup, that's $99. Thinking about possibly buying a Sapira? CLICK HERE to go to their web site! You can now also view or buy a Sapira on Amazon! Stay tuned for my updated review! I think Leesa is a great company which was featured as a top 10 company of 2017, I have also read about Nectar mattresses. They have amazing deal, 365 trial and $100 off any size. No bed goes over 1k...you should look into it as well. Regarding the Nectar mattress, I do plan to contact them in the future to see if they would be willing to have me do a review of their mattress. Might be a few months down the road. Good news! I now have a Nectar review!